Click here when you are ready to enroll. To provide Pennsylvania's elected and appointed local officials and staff with the leadership skills and professional development needed to meet the demands and expectations of their office or position, today and into the future. Complete all PMGA requirements by January 31 for recognition at that year's PSATS Annual Educational Conference, in the Pennsylvania Township News and at your next county convention. PSATS will also notify your local news media of your accomplishment. Applications can be completed through the online store. You'll earn credits for attending PMGA classroom courses and webinars, as well as PSATS' Annual Educational Conference, Boot Camp for newly elected and appointed officials/staff, and much more. Choose between the Graduate Program or a Certificate Program (see below). Administration, Planning/Zoning, Public Safety and Public Works. Each emphasizes leadership development and communication skills. The Graduate Program is structured to include courses from all four tracks and requires you to obtain 20 Primary-level credits, 25 Secondary-level credits, and 15 elective credits. The Certificate Program allows you to concentrate on one of the four tracks. To obtain a Certificate in a specific track, you must obtain 8 Primary-level credits in that track, 16 Secondary-level credits, and 6 elective credits. Essentials of Township Administration Course – This course provides a broad overview of municipal administration. Experts discuss the Second Class Township Code, human resource issues, risk management, Right-to-Know Law responsibilities, budgeting and municipal accounting, audits, investments and pension management. Other Administration Track Courses - PSATS also offers a number of other courses eligible for Adminsitration Track credits, including Basic Training for Secretaries/Administrators, the PSATS HR & Labor Management Institute, and classes covering township budgeting, the Right-to-Know Law, Sunshine Act and Ethics Act, and Quickbooks training. Essentials of Township Planning/Zoning Course – Municipal planning/zoning responsibilities covered by our experts include the Pennsylvania Municipalities Planning Code, subdivision and land development, zoning, duties of the planning commission and zoning hearing board, and administration and enforcement of the Uniform Construction Code. Other Planning/Zoning Track Courses - PSATS also offers other courses eligible for Planning/Zoning Track credits, including a Zoning Officers Symposium in the spring and fall and a Duties of Zoning Hearing Board Members class. Essentials of Township Public Safety Course – In this course, our experts discuss topics such as fire service, emergency management, police, ambulance service, mutual aid, homeland security, and municipal liability for volunteers. 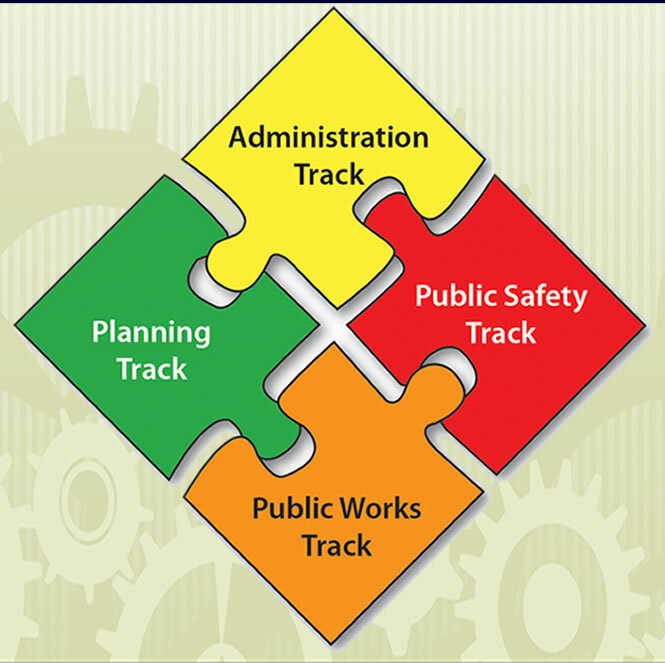 Other Public Safety Track Courses - PSATS also offers other courses eligible for Public Safety Track credits, including TEMA Forums in the spring and fall, NIMS and Incident Command Systems, and the Township Role in Emergency Management. Essentials of Township Public Works Course – This course provides a broad look at municipal public works responsibilities. Topics covered by our experts include road and bridge maintenance, road safety, stormwater management, traffic signs and signals, and posting and bonding. Other Public Works Track Courses - PSATS also offers other courses eligible for Public Works Track credits, including courses on CDL Probable Cause Training and CMV/CDL Records Management, Performing MS4 Outfall Inspections, and more. All Academy participants must attend a day-long Introduction to PMGA, a program emphasizing leadership skills and preparation for the four educational tracks. Primary courses provide a broad overview of the principal components of each track, with an emphasis on leadership and communication skills. Secondary courses are offered both in webinar and classroom formats. expertise and knowledge or for developing and/or presenting courses.